Watch video of Lydia Polgreen’s keynote presentation or her discussion with Evan Smith. 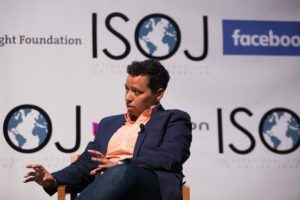 Lydia Polgreen, editor-in chief of The Huffington Post, unveiled her plan at the 18th International Symposium on Online Journalism (ISOJ) on April 21 to revolutionize news consumption by creating platforms that appeal to the masses who do not usually follow the news. A Gallup poll found that 27 per cent of Americans said they had confidence in the nation’s banks, down by half from 53 per cent in 2004. According to the poll, Americans distrusted banks for three reasons: they didn’t need a bank, they couldn’t afford one and their customer service needs were not being met. These same issues, Polgreen and Benton argue, impact news media consumption. The mainstream news media fell under scrutiny during the 2016 presidential election. According to a poll conducted by YouGov, 27 per cent of respondents were avoiding the news during the election. Create proximity: Polgreen suggests journalists have to bridge the gap — if news consumers don’t feel journalists are connected to their lives, it’s hard to trust them. Build platforms for listening: Polgreen believes listening is essential to journalism. Because research on “unnewsed” people is focused on sociological rather than financial information, news organizations must make listening to their audience a priority. Put the news consumer in control: News organizations must find a way to give some sort of control to the user, which is why Polgreen believes they should create a blogging platform to encourage the audience to tell their stories in their own way. Technology doesn’t solve the biggest problem: Although technology changed the way news organizations can interact with their audience, Polgreen argues it cannot solely solve the problem of creating relevance among news consumers. Emotion, humor, and empathy are vital to attract the “unnewsed: While facts and truth are essential in news, Polgreen argues they are simply not enough. Emotion, humor, and empathy must also be practiced by news organizations. Verizon acquired Huffington Post in 2015, after the telephone company purchased the then-owner, AOL, in a $4.4 billion deal. Responding to questions from Smith about following in the footsteps of the renown Ariana Huffington, co-founder of the Huffington Post, and Polgreen’s editorial independence given Verizon’s ownership, the former New York Times journalist said these circumstances will not influence her work. Livestreaming of ISOJ can be viewed on the organization’s website.